As flow control needs change and your interest moves from series to series, model to model, remember that all are but variations on this single theme — the OCV Basic Control Valve. 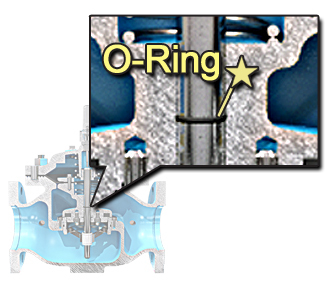 OCV valves are hydraulically operated, diaphragm actuated for multi-function control of non-corrosive, non-abrasive fluids. Available in globe or angle configuration, these fully automatic valves operate off line pressure or if desired, from an independent power source. Our wide range of control pilots makes it possible to offer combination models for virtually any fluid-handling need. 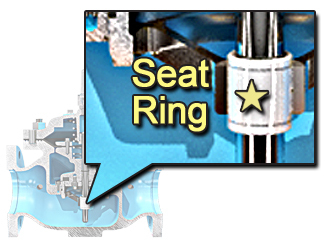 The basic Series 65 valve contains only one moving part. 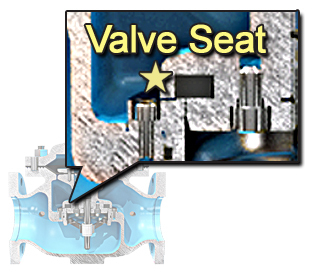 This simplicity of design promotes dependability, reduces down-time, facilitates service and extends the life of the valve. 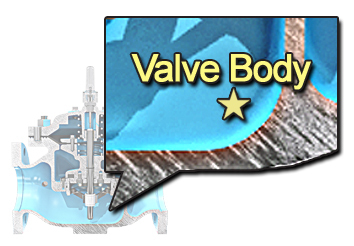 Whether you are an engineer, contractor, distributor, operator, or just an interested Internet passerby, a few minutes spent browsing through the valve components will enhance your understanding of the OCV Basic Control Valve. 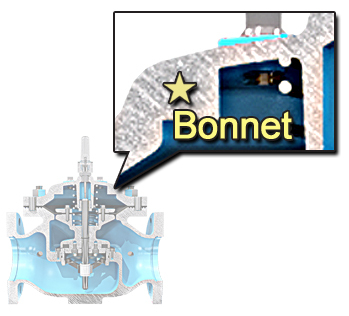 Separates the operating pressure in the upper chamber of the valve from the line pressure in the lower chamber. Available in many materials including EPDM, Buna-N (standard), and Viton ® (available if required), all Nylon reinforced for high strength and long life. 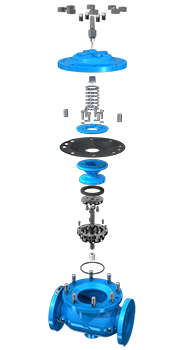 Stainless Steel cap screws attach the diaphragm, allowing replacement of the diaphragm without removing the complete assembly or valve from the line. Creates a static seal on the stem. EPDM, Buna-N or Viton ® compensates for wear on seating surface and maintains a drip-tight seal over extended service life. This Bronze or Stainless Steel ring is replaceable and provides a lower guide for stem assembly. Globe pattern 1-1/4″-24″, angle pattern 1-1/4″-12″ & 16”. Flanged valves sizes 1-1/2″-24″, threaded ends 1-1/4″-3″. Available in Ductile Iron, Carbon Steel, Aluminum, Bronze and Stainless Steel alloys. Iron and Steel bodies are coated inside and outside with a baked on epoxy finish. Tapped ports on the inlet and outlet provide for control circuit piping. Also Available in Nickel Aluminum Bronze, Super Duplex Stainless Steel and other exotic alloys, depending on your service requirements. 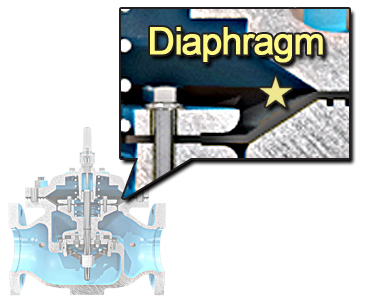 Comprised of a diaphragm plate, diaphragm, spool, seat, retainer and stem. 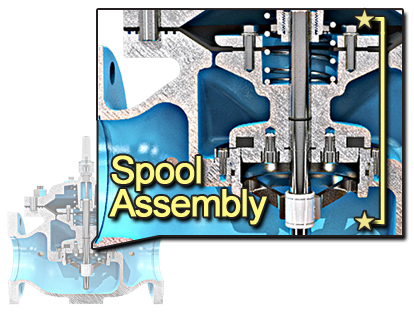 This assembly is the only moving part of the valve. Drip tight closure and movement with minimum friction is accomplished by top and bottom guide bushings of Bronze or Teflon. 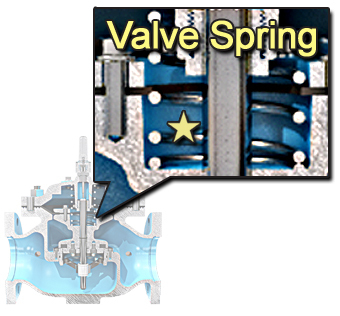 Stainless Steel spring aids in closing the valve. Four tapped ports for pilot piping. Center port for valve position indicator or valve actuated switches. Epoxy coated same as body.